I’ll be the first to admit that I’m not a big expert on science fiction. Oh, I’ve read my share of Heinlein, Clarke and Asimov, I’ve read most of the Bradbury anthologies, and I own a ton of science fiction pulps, some of which I’ve actually read from cover to cover. I’ve been through every episode of the Star Trek canon, at least twice, seen all of the major sf movies made since the early seventies, and I even sat through the first half hour of Star Wars: The Phantom Menace. But I’m no expert, or even close to being one, for no other field of popular culture seems to engender such fanatical attention to detail. Science fiction fans love their science fiction, to the point that any philistine who dares broach an opinion on the subject that someone disagrees with will know it pretty quickly. The fact that so much early science fiction has survived in a fairly available form is thanks to the men (almost always men) who purchased, read, saved, collected and catalogued the pulps where most of this literature originated. No other area of pulp writing can make this claim. Back in the days when I was collecting, a visit to any used book store in the Washington, DC area would reveal any number of sf pulps for sale, in various states of survival, and usually for a pretty penny. But trying to locate a mystery pulp, or a sports pulp, or a love pulp was nearly impossible. These magazines were never afforded the reverence that the sf pulps were, and far fewer of them have survived the years since they first appeared on newsstands. John D MacDonald wrote for the pulps and, with the exception of love pulps, tried his hand in every genre, with varying degrees of success. He didn’t do too well with the western or horror pulps, provided adequate material for straight fiction pulps, and, of course, excelled in the mystery/crime pulps. I would also argue that he excelled equally well with the science fiction pulps. I prefer the science fiction of John D MacDonald over other sf because I prefer the writing of John D MacDonald, the strength of its straightforward prose, the focus on narrative and character, and its ability to transport and transcend. Martin H. Greenberg, the editor of Other Times, Other Worlds, put it this way: “All his fiction, both sf and mystery, is characterized by strong portrayals of social and psychological types, and the strengths and weaknesses that typify the human condition.” Greenberg nominated three of the sf stories contained therein as “minor classics,” even though they were virtually unknown to the reading public at large. Among the many, many contributors to the Bib over its long run, names that would draw a blank even from fans of the author, was John D MacDonald himself. JDM took an interest in the journal from the very beginning, especially because its original intention -- to definitively catalog his entire literary output -- would aid him in preparing anthologies of his older short work, an idea that wouldn’t come to fruition until 1978 with Other Times, Other Worlds, and later in 1982 with the first edition of The Good Old Stuff. Over the years MacDonald contributed a variety of different kinds of writing, ranging from essays on writing, reminiscences from his wartime years, a piece on the aging of Travis McGee, and many answers to reader’s questions and comments on prior articles. And, yes, a few pieces of fiction appeared in its pages. Right before he left for heart surgery in 1986 (the operation that would lead to his death) he submitted a piece he thought had never been published before (“The Killer”). And way back in the early days of the Bib, in 1966, he sent in a short science fiction story titled “The Spiralled Myth,” an 850-word tale that he knew had been published previously, but details of the publication were lost to him. All he knew was that it appeared in April 1948 in something called The Spectator Club. That year, 1948, was a tumultuous one for the MacDonald family. They began it living in the college town of Clinton, New York, a place they had moved to the previous year in hopes that the academic atmosphere would be conducive to the MacDonalds’ artistic sensibilities. What had begun with hopes of stimulating intellectual relationships and dialogues ended with venal spats about who was allowed to come to tea parties, and gossip about who was screwing who. Dorothy’s mother Rita was ill and died in June of the year. That fall, after clearing up the estate, the family took the bold step of packing everything up and moving to Mexico, inspired by descriptions of the American artistic community in Cuernavaca in Malcolm Lowry’s novel Under the Volcano. So it’s understandable that MacDonald’s otherwise meticulous record keeping could have fallen off the rails during this period of his life. And I would add, abstruse. “The Spiralled Myth” opens with a man and a woman walking along a city sidewalk. Told in third person limited from the woman’s point of view, the first paragraph lets the reader know that they are going to have to pay close attention. As she walked along beside him, she thought that it would be far better if he never walked. Standing, he was white, firm and unified, with bones and flesh neatly arranged in solid pattern. When he walked it was as though a generator bolted to the concrete of a power plant, tore loose the bolts and galumphed away. His white cheeks juggled and shook and the spasm of his step was uncertain and swooping, making her wary lest he might fall. The first time I read “The Spiralled Myth” back in the early 1980’s I didn’t know what to make of it. I still don’t, although repeated readings bring the author’s intentions into better focus. This could be science fiction, or perhaps not. It could be the workings of a person’s mind, a madness that plays out over and over again endlessly. The reader can make any assumption they like, as there doesn’t seem to be any definitive interpretation here. That it was intended as science fiction is taken as a given in the JDM world: it was included in a listing of MacDonald’s science fiction short stories compiled by Martin H Greenberg in the back of Other Times, Other Worlds. But it is doubtful that it would have been accepted for publication by any of the standard science fiction pulps that were around in 1948. It is far too indirect and, at 850 words, way too short. And at 2-cents a word, MacDonald would have cleared $17.00 for his effort. For years I had assumed that The Spectator Club was an obscure science fiction fanzine. These homemade journals were prevalent when MacDonald began writing and he even talked about their popularity in one of his Clinton Courier newspaper columns. But the actual facts reveal an even more unlikely source. Named after an eighteenth century daily periodical published in England, The Spectator Club was a limited circulation prozine (professional magazine) that was open to publishing the works of professional and semi-professional writers in the New York City area. The list of contributors, in addition to MacDonald, included Robert W. Lowndes, Charles Dye, Alexandra Krinkin, H. Beam Piper, Nat Schachner, Lester Del Rey, Philip Klass, Morton Klass, Theodore Sturgeon, Hannes Bok, and Frederik Pohl. The journal lasted only about two years and published at least eight issues, with a run of only about 50 (the number of issues was based on the current membership). To say that this would be a rare find is not overstating the matter. I discovered this information from an entry on a rare books website, where the collected volumes were available for a mere $464.00. (Somebody bought it… it’s no longer available.) Exactly how MacDonald became involved with this endeavor is a story lost to time, and the author himself does not seem to have recalled it when he donated “The Spiralled Myth” to the JDM Bibliophile in 1966. Outside of its original appearance in The Spectator Club and its republication in 1966, “The Spiralled Myth” was reprinted one more time, in a subsequent issue of the JDM Bibliophile. Issue Number 9, printed in March 1968, was a special “reprint edition” of the Bib, done in response to a flood of new subscribers who joined after learning of the journal in Anthony Boucher’s New York Times column “Criminals At Large.” Len Moffatt’s original preface to the piece was reprinted as well, indicating that no one had learned anything more about the mysterious Spectator Club. Once again, a thank you is due Chris Ogle, who writes the John D MacDonald Covers blog, for obtaining a copy of the JDM Bibliophile from the MacDonald collection at the University of Florida for me. My original BIB’s, or at least the first 19 issues, were lost years ago in a house move. I’m still wondering what in the hell I did with them..
"Conversation on Deck" and "The Game"
The chronicle of how John D MacDonald decided to become an author -- going from the security of a military career to the leap-of-faith of freelance fiction writing --was told so often and in so many interviews during his lifetime that it took on the aura of a super hero’s origin story. It goes like this: While stationed in Asia during the second world war, he wrote a short story to entertain his wife back home, mainly because censorship of his letters robbed them of anything interesting to communicate. Without telling him, Dorothy MacDonald typed the story into manuscript form and submitted it to Whit Burnett’s Story magazine, a monthly small press periodical specializing in publishing the works of new authors. Burnett purchased the story for publication and paid the author $25 for the honor of doing so. Dorothy saved the good news until her husband's return home, and MacDonald was so dumbfounded when told that he quit the army and decided to become an author. Living off of a military form of temporary severance pay, the MacDonalds -- John, Dorothy and seven year old Johnny -- settled into the second story apartment of a large house on State Street in Utica, New York, and it was here where, MacDonald recalled, he “worked harder than [he] ever had in his life”. Sitting in front of a typewriter in a small storage area off of the living room, he wrote for 14 hours a day, seven days a week, eating little, smoking cigarettes and eventually dropping 20 pounds. He wrote story after story, sending out these unsolicited manuscripts to a long list of possible magazines, producing 800,000 words of fiction and selling -- nothing. MacDonald has often stated that during this period he collected over 1,000 rejection slips without a single sale. MacDonald sarcastically characterized these “dreadful” stories as “wonderful, beautiful things about dying blind musicians,” and one often needs to be reminded that he did not set out to become a mystery writer, or even a pulp writer. He was attempting “serious” work and was focusing on the slick magazine market and the small press. Working without an agent he would make a list of possible publications for each story, put them on an index card and send the story off in the mail, marking off each possibility when it was rejected and returned. When it came back from the last magazine on the list the work was mothballed. Starting work in October of 1945, it wasn’t until February 1946 that he was able to sell his second story, to Mike Tilden of Popular Publications. It was a tale he titled “Paint on Her Hair” but eventually appeared in the October 1946 issue of Dime Detective as “Female of the Specie”. “Then I thought,” MacDonald recalled, “well, maybe if I lower my sights a little and work a little bit harder -- by then I was a readjustment case -- maybe it’ll work.” He sold another few pulp mysteries to Popular, a few to Babette Rosmond, who edited both Doc Savage and The Shadow, and even a few of the early non-crime tales found their way into a non-genre pulp of the time, Short Stories. He was off and running. But this account, recalled and repeated in every one of his biographies to some degree or another, ignores two short stories that were published before any other, MacDonald’s first and second ever appearance in print. The publication was called The American Courier and MacDonald didn’t earn a dime for either of them. JDM began his writing marathon in early October 1945. As early as October 8 he had finished product and was sending it out for consideration. As the rejections came pouring back without a nibble MacDonald became anxious and began looking for any possible forum for his work. He must have learned of The American Courier through a source such as the then-current edition of Writer’s Market, and if so, he would have been hesitant to go there first as it would have been made clear that The American Courier did not pay for the stories it published. MacDonald was, after all, trying to make a living. The author relented, according to JDM bibliographer Walter Shine, because he “had thought it might help to build his reputation as a writer.” He had certainly never seen or read an issue of The American Courier, and it is virtually impossible to learn anything about this obscure journal. But in mid November of 1945. he sent two of his stories to the Courier: “The Game,” one of the earliest stories he had written and one that had already been rejected by five different magazines, and “Conversation on Deck,” written in late October and rejected by one other magazine. Both were accepted. “Conversation on Deck” appeared in the January 1946 issue and “The Game” in the following month. Happy to have finally sold something, MacDonald was anything but happy when he received his tearsheets in the mail. The American Courier, far from being a respectable Story-like small press magazine, was in fact “a mediocre, typewritten ‘magazine’ showing no trace of professionalism” (Shine’s characterization). Produced on a mimeograph machine with a block lettered, hand drawn masthead and primitive illustrations of presidents Washington and Lincoln, the magazine looked more like a junior high school newsletter than a small press journal. Whatever hopes JDM had for building his reputation must have been immediately replaced by an abashed embarrassment. Who on earth would be reading such a “magazine”? While they are certainly not “dreadful,” had MacDonald not submitted these works to a publication such as The American Courier they most certainly would have been among the infamous 800,000 unsaleable words, for it’s doubtful any legitimate magazine would have printed them. While the writing is basically serviceable, the plots are obvious and derivative, and the characterizations are -- to put it politely -- amateurish. And both are representative of the early work MacDonald was able to get published, in that they both draw heavily on his military service during the war. “The Game,” which is quite possibly the first short story MacDonald wrote when he began his marathon endeavor, is set in wartime Ceylon (Sri Lanka for all you younger folks) and features a cast of British soldiers who seem to be involved in the same sort of early espionage that the author himself was doing during his stint with the OSS. But espionage and warfare have little or nothing to do with the plot, which is basically the old saw of a man slowly going mad after he loses his girlfriend to another man. I mentioned earlier about how most of this early learning-experience work of the author’s was directed at the slick magazines of the time, but “The Game” does concern a murder and was submitted to both Adventure and Dime Mystery before being rejected by both magazines. “Conversation on Deck” is a different animal altogether, although it does share with “The Game” a background in wartime Southeast Asia. The title of the short story reveals the simplicity of the plot, if one can even call it a plot. We’re on a transport ship in the Pacific during World War II, part of a large convoy of “AP’s,” headed for the atoll of Ulithi. With each ship carrying over three thousand passengers, and with the lower decks of the ships like “living in a steam bath,” men were permitted to sleep on deck. Officers were awarded places on the top deck, the most comfortable and desirable sections of available above board ship. The story concerns one group of officers in particular, eight in number but only three who drive the story: the first-person narrator-observer, and two majors, Ike Neal and Wendell Howity. “[Ike Neal] was a peashooter driver who hoped to tranship at Ulithi for stateside on a war weary basis. He looked like he had Indian blood in him. Red bronze color with high cheekbones and heavy brows. He had a wonderfully strong body, heavy shouldered with knots of muscle whenever he moved. In spite of his twenty-five years, those heavy brows gave him the look of a movie villain -- not the drawing room type, but more the sort of guy who always robs the stage coach and shoots the peaceful settler. He had a glib line of chatter, but his conversation was one hundred percent composed of the telling of incidents in the life of Major Neal. Most of his incidents concerned his love life, but every once in a while he would hand us a tale of his exploits in the world of sports. I gathered that he had played every kind of rugged game know to man. And so it goes, night after night, with every subject raised in conversation by another group member providing an opening for Neal to interject one of his long-winded tales of female conquest. His interruption is a loud, pointed and almost confrontational “Major Neal!” Neal is, for once, thrown off guard and silenced. Howity proposes an odd wager with Neal. In the brief silence that follows the narrator describes a feeling of dizziness and the group’s “sense of our own puniness in the gigantic plan of stars and constellations.” Neal continues hesitantly with his own tale, describing his meet-cute with a nice looking woman in a bar, then stops again to let Howity continue. He asks everyone to feel their blankets and to imagine the microscopic particles that make up those blankets, how they originated and how they will return to their origin, and how it relates to the light from the stars they are looking at. Neal resumes another round and Howity responds with another deep thought, then Neal gives up rushes to the end of his story. I don’t usually reveal endings to the short stories or novels I discuss here, but with “Conversation on Deck,” there really isn’t any ending to spoil. Neal and Howity eventually become closer and are often seen conversing together, while the narrator can only try and relate how profound Howity was and how something happened that night, but he isn’t entirely sure what. Both stories are for MacDonald completists only, with little to offer of literary value and are instructive only to those interested in the progress of JDM’s writing talent. Suffice it to say that it began roughly. 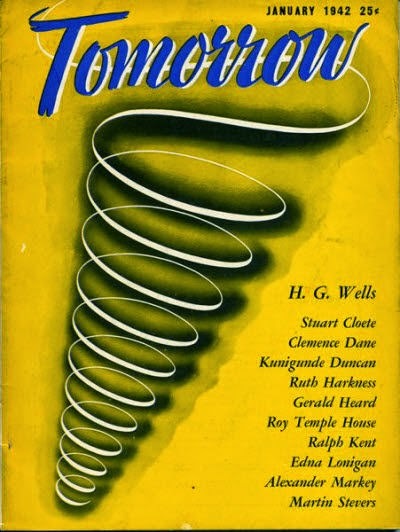 must be some obscure science fiction pulp I had never heard of, but there doesn’t seem to have ever been an sf pulp called Tomorrow, and neither of these stories could be called science fiction even under the broadest of terms. No, the Tomorrow that MacDonald submitted these stories to was a magazine founded in 1941 by a famous medium and psychic of the day, Eileen J Garrett. The Jeane Dixon of her time (for those of you old enough to remember Jeane Dixon), Garrett’s interests were broader than parapsychology (authoring several novels under the pseudonym Jean Lyttle) and she founded Tomorrow as “a literary journal, devoted to the finest in writing and thought.” Parapsychology was certainly its focus, but fiction by authors such as Thomas Mann, August Derleth, Eudora Welty, Stuart Cloete and Harvey Jacobs appeared in its pages. Garrett was editor for much of its run, but in 1961 it was assumed by the Parapsychology Foundation and became a quarterly featuring only non-fiction. Why John D MacDonald thought his two stories would be suitable fodder for the readers of such a periodical can only be guessed at. I suppose it couldn’t be stranger than one of his stories, “The Cardboard Star.” appearing in the Catholic magazine The Sign. 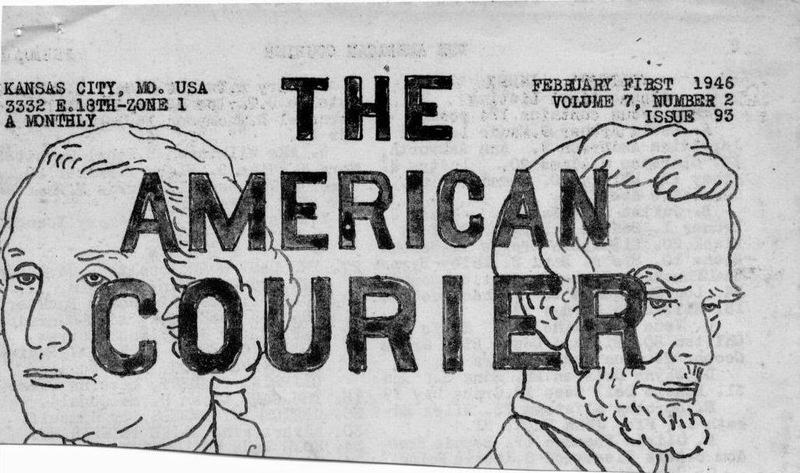 Image of The American Courier masthead courtesy of the John D. MacDonald Collection, Special and Area Studies Collections, George A. Smathers Libraries, University of Florida, Gainesville, Florida. 2X2L calling CQ . . . 2X2L calling CQ . . . Isn't there anyone on the air? On December 25, 2011 I posted a piece on The Trap of Solid Gold commemorating the the twenty-fifth anniversary of the death of John D MacDonald, a reprint of something I had put up two years earlier, but with a few added comments. It was to be the last posting to the blog, although I didn’t know it at the time. I was working on two other pieces, one on an old Doc Savage novella and the other on the novel A Man of Affairs. But I never got past the planning stages. On New Year’s Day I received a telephone call from my son asking my wife and I to look after his eight-month old son for a few hours, as he and his wife were on their way to the emergency room of the local hospital. His wife had been experiencing excruciating head and neck pain for the past two days and their local hospital couldn’t find anything obviously wrong with her. An hour later our grandson was dropped off and my son and daughter-in-law headed for the Murfreesboro emergency room. That brief babysitting duty eventually turned into a year and a half of living with us, not just our grandson, but our son and our daughter-in-law, as they worked their way through an illness that was eventually diagnosed as something called Trigeminal Neuralgia. I’m happy to report that the illness has been dealt with --- without the brain surgery that doctors were recommending -- and the kids are living independently, close by, happy and with another child, and once again it’s just me and my wife here in the house. Trying to write was, of course, impossible under the circumstances, and even after they departed, it was tough to get back into the swing of things. I had packed up all of my JDM stuff, the old pulps and magazines, to protect them from the mischievous hands of my toddler grandson, and they stayed packed even after we were alone again. I got involved with another project a few months before the kids moved out. Writer Elaine Ford, author of five excellent novels and a distant cousin of mine, asked me to assist her with researching what started out as a short story and eventually turned into an historical novel about our mutual ancestor, Thomas Lawson Ford, who lived from 1807 to 1882. It was enjoyable, time consuming work that lasted over a year and required a couple of weeklong trips to rural Mississippi and much time spent in dusty storage areas of old courthouses. Meanwhile, my MacDonald books were still up on a high shelf, and eventually I began bringing them down and rereading them. I made my way through the McGee canon earlier this year and it got me interested in seeing if I could maybe try and get the old blog up and running again. Back when I began writing The Trap of Solid Gold I was unemployed, living off of a generous severance package from my employer of 30 years, a “victim” of the Crash of 2008. I had all the time in the world to read, research and write about my favorite author, a wordsmith I had idolized and followed since 1974, and in the first months of writing I posted something every single day. Now the severance is long gone and I’m forced to do honest work again, so my time to blog is limited. I’m going to try and do a posting a week and see if I can keep it up. Some of the pieces -- especially the ones on the novels -- require a great deal of time to research, outline and get down onto “paper,” so when I’m preparing those particular writings it may take a bit longer. And speaking of republishing, there’s been a big change in the John D MacDonald world since I posted that last 2011 article. Almost every one of MacDonald’s novels and anthologies, even two he never wanted published again, have been issued as eBooks, available to anyone with an eBook reader and $9.99 to spend. (The exceptions are The Executioners, S*E*V*E*N, and Other Times, Other Worlds). I’ve purchased and read two of them and they are well done, finely crafted products that are worth every penny… certainly nothing like the sloppy Death Quotient and Other Stories. And there’s a nice introduction by Dean Koontz in all of the non-Travis books. I’ve added considerably to my own JDM collection in the three years since I last posted. Of those 400 short stories and novellas I now own nearly 300 of them, and a lot of the earlier postings that relied on anthologized versions of the stories now feature some original story art from the magazines. I’ve spent the last month or so rereading and proofing all of my prior postings, cleaning up some sloppy grammar and fixing typos, so hopefully it will be a better resource for the student of the author. I resisted the temptation to rewrite a few of the pieces that weren’t that well thought out. Perhaps one day, but not now. And as before, I won’t advertise on this blog and I certainly don’t make any money writing it. I do it because I enjoy writing and sharing it and will stop when that is no longer the case. My audience was never big to begin with and has probably scattered to the four winds since 2011, but I’m hoping at least a few of you will find your way back. Never being one for self-promotion, I’m just going to write it, post it and move on the the next piece. Also as before, I’ll accept comments here, but I’ve found the need to moderate them, so they may take a day or two to post. Spammers have discovered the site and, even after years of being idle, I still have to delete three or four fake “comments” everyday, comments which purport to be saying something about the specific post (in the most general of terms) but which invariably contain a link to some nefarious website trying to sell something. The genuine comments that are proffered will almost always get printed, provided they are civil and constructive. You may disagree with me, but please do so without any ad hominem. If you want to contact me outside of commenting, just click on my name in the About Me box on the right and then click the Email link under Contact Me. My first piece should post in about a week, and I’m really looking forward to writing again. Finally, a huge “thank you” to all of the followers who have sent me encouraging and supportive emails and comments these past three years. Also to all of you who commented your appreciation of the blog when it was active. I hope that what I do here from this point forward is worthy of your continued readership.